Here's a guest article on the best cookware - from a green perspective. There are many things to consider when buying cookware. Eco-friendly credentials are just one - but an important one. We all want value for money and eco-friendly cookware will deliver on that. But the upfront cost of many kitchen utensils may well put many of us off buying. It can be easy to be seduced by cheap products which just do not last the course. This article was kindly supplied by Cookwarehelp.com and is mainly about the benefits of using a wok as part of your cookware arsenal. There is also a brief discussion of the merits of aluminium and copper equipment. Today more and more people are looking at the impact that seemingly small things are having on the environment. The issue of cooking pans is not necessarily as simple as it would first appear. What appears to be eco-friendly is not necessarily so. For instance aluminium is made from mined bauxite (which uses a lot of energy in production but there is no limit to the number of times that aluminium can be recycled. On the surface it appears that aluminium is an eco-friendly material for pans. Unfortunately the process of refining aluminium to make a pan is also very intensive and the embedded energy of production is high for aluminium. It takes three times as much energy to refine aluminium as it does copper. So aluminium is perhaps not the best cookware material for most uses. The king of the materials for conducting heat is copper which is one of the reasons why restaurants always cook their sauces in copper based pans. The best restaurants cook the sauce for your steak in front of you because copper based pans are so attractive to look at. Unfortunately copper based pans are also expensive to buy, so most people do not regard copper as the best cookware material. How to cook in a shield! There are other ways of reducing your carbon footprint when preparing food. The method that you use to cook food will also have an impact. One of the fastest and healthiest ways of cooking food is by using the stir-fried method. Legend has it that the Mongols when conquering Asia used their shields as pans to cook their food when travelling. This allowed them to travel lighter and faster and allowed them to win many a battle. However cooking with a Mongol shield is the not best option for most families; modern families tend to use a wok. The old-fashioned woks had a large round base and they wobbled all over the stove. Today most of the woks have flat bottoms which conduct heat better in the bottom and are also safer as there is no danger of fat or other substances flying out. One of the benefits of purchasing a wok for cookery is the fact that they fulfill so many functions. You can sauté food, fry it, stir fry it, braise it, casserole it, deep fry it and virtually anything else you want to do with it. The wok comes in many sizes and is made with many types of materials, some are expensive, some practical, and some eco-friendly. Carbon steel - as found in this Joyce Chen Classic Series Wok Set is easy to season. It can begin to stick after a time. The way to restore that wok to be non-stick is to re-season it. There are such things as Teflon coated woks; however they are scorned by most professional chefs. There are several reasons. Teflon* taints the food - you can taste it on the food and also it does come off. Everyone who has used some type of Teflon cookware (and let's face it, that is probably all of us) have had black flecks of plastic on our food at some time or other. *Please see the bottom of this page for more on why teflon coating might not be such a good choice if you are seeking the best cookware. Perversely, many professional chefs also prefer the round bottom wok. It seems to get hotter and conduct the heat better than its safer, flat-bottomed variety. The reason for this is the fact that the bottom heats up quickly and evenly but that heat is not evenly distributed up the rounded sides. To some extent it does depend on the type of food that you intend to cook and the method you intend to employ. A wok is an eco friendly pan because it does everything - but its main purpose is for stir frying. The traditional wide spatula does not hit the corners in a round-bottomed one. Many professional chefs report that the flat-bottomed woks don't cook food as evenly as the round ones. Another advantage to a round one is the fact that it is easier to flick all the food out including tiny pieces of chopped garlic adhere to the wok's surface. It is easy to clean the wok when there is no food sticking to it and it saves energy on hot water and detergent and also the gas to heat and dry the wok to stop it rusting. The shiny patina on a wok does not happen overnight; it is a result of stir-frying with very little oil and a high temperature for a prolonged period of time. The more you have to scrub and clean a wok the more likely it is that this surface will be damaged. When you purchase a new wok it has a protective coating from the factory and this has to be removed. It is then seasoned which will turn the shiny new metal black but that seasoning is the process that makes the wok and makes it so efficient a cooking medium. The best fat to use is either lard or peanut oil. Heat the wok on top of the stove until it is smoking hot and then carefully with a piece of cloth, brush the fat evenly over the wok to get an even coat. Do not pour an excess amount in because you will have a fire on your hands. Turn the heat down to its lowest setting and leave the wok absorbing the oil for 20 minutes. If it looks as though it is drying out a bit during this time then brush a little more fat over it. After 20 minutes the wok should be an intense shiny black color. After 20 minutes turn off the heat and leave the wok where it is to cool completely. When it is cold, wipe the inside with a hot sponge and then put it back on the gas again to dry completely. Don't ever attempt to scour that blackness off. It is a protective coating of carbon. It is not toxic and it will not harm you, it is merely to prevent the food from sticking. Should the wok get rusty again then re-season it. Woks should never be scoured or scrubbed because this takes away the seasoning. Equally, never use your current wok as a steamer. They do make great steamers but it is better to use an old wok just for this purpose, because the steaming process can affect the seasoning. Re-season the wok frequently, so that the food does not stick and therefore cooks more evenly and makes the wok easier to clean. When a wok is washed never leave it wet. Put it back on the heat to dry out properly. We can all reduce the impact of our cooking on the environment. We need to choose the best cookware for green living in the modern world. A wok might be the best and simplest choice for the main cookware for your home. *More on teflon coating: While teflon is undoubtedly convenient as a coating for cookware, there are some environmental and health dangers to consider. Teflon is a made of a kind of plastic, PTFE (Polytetrafluoroethylene) which may break down to emit perfluorooctanoic acid, or PFOA. It degrades in temperatures above 250 degrees Centigrade, so if you are cooking a lot at high temperatures (meat, flash frying - or even just burning your pans!) then it may be best to avoid teflon. Some oils, such as safflower will cook at high temperatures without burning, so it might be wise to avoid the combination of such oils with teflon coated cookware. As anyone who has used teflon much knows, it does gradually break up from abrasion and accidents, too. There have been concerns that it may cause some cancers. The US Environmental Protection Agency did a study which showed that it turned up in the blood of people across the USA. It is also a persistent environmental hazard as it does not break down at all in nature. It is also known to kill pet birds kept in households that use PTFE coated pans. 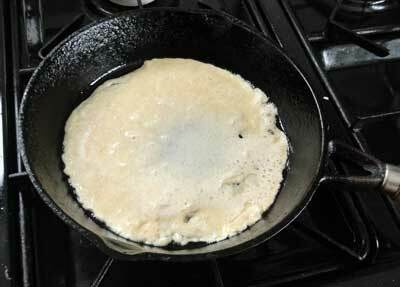 There are some types of non-stick cooking pans which do not contain teflon. Le Creuset (the French cookware company), for example, uses a type of enamel on the inside of their pans which allows for high temperature frying without hazardous particles or fumes being given off. For the best cookware from a health perspective, avoid teflon and stick to cast iron, steel and enamel pans. See the EWG for more on toxic hazards and the environment.